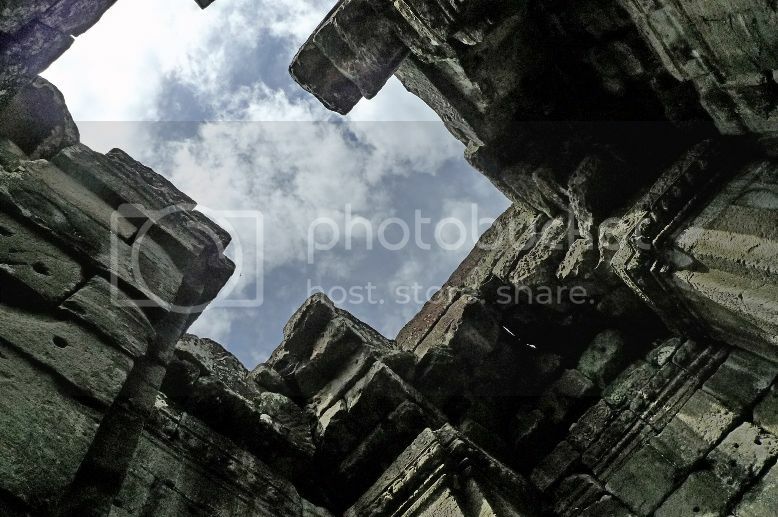 Of all the temple ruins I visited in the Angkor Wat Archaeological Park, the Bayon temple is my absolute favourite! 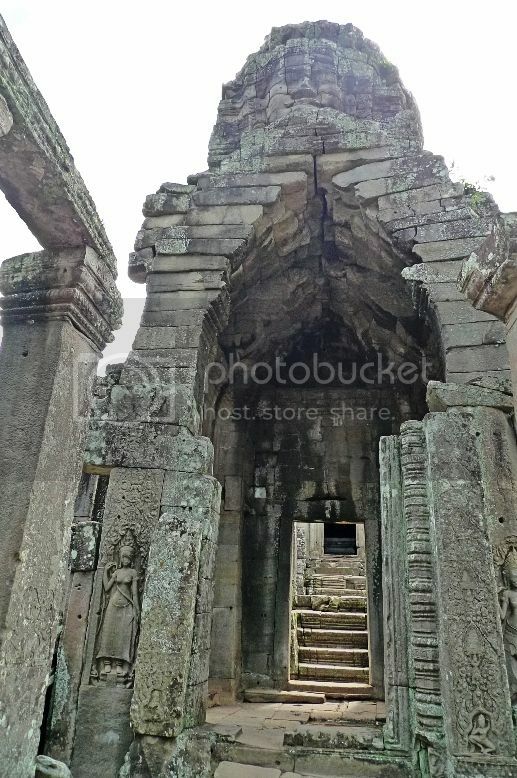 Located in the middle of Angkor Thom, the Bayon temple was built in the late 12th or early 13th century as the official state temple of the Mahayana Buddhist King Jayavarman VII. After passing through the Victory Gate, we headed straight to Bayon. At the main entrance, I saw this signboard. 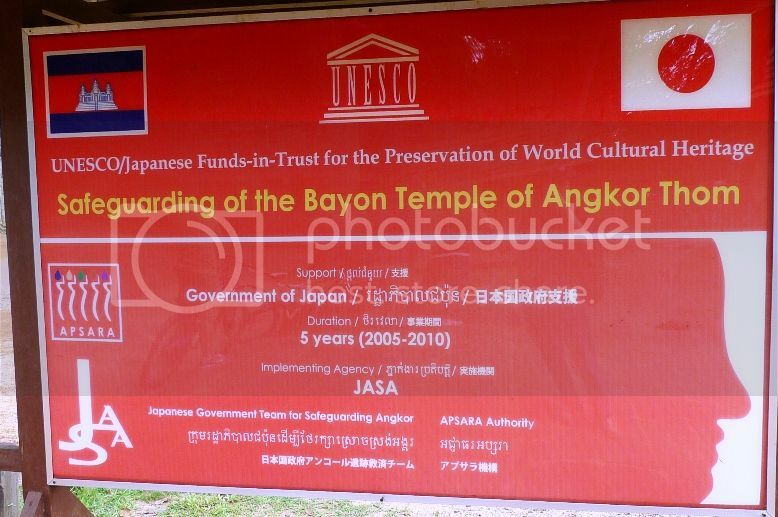 It appears that the Japanese Government had committed to finance UNESCO's project to preserve, restore and safeguard the entire Bayon complex. Wow! I think they deserve an applause! 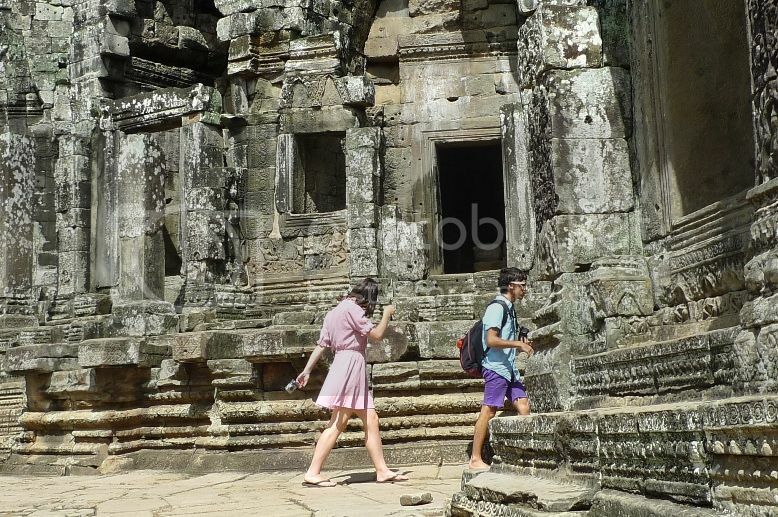 I was told that the best time to visit Bayon Temple would be in the morning, preferably before 10am as that period provides optimal lighting conditions to bring out the best in photography. Jam, his friend and I went there after 2pm, so I guess the pictures we took were not really good. However, loads of tourists visit in the morning, so I guess it was OK - anything to avoid the crowd! 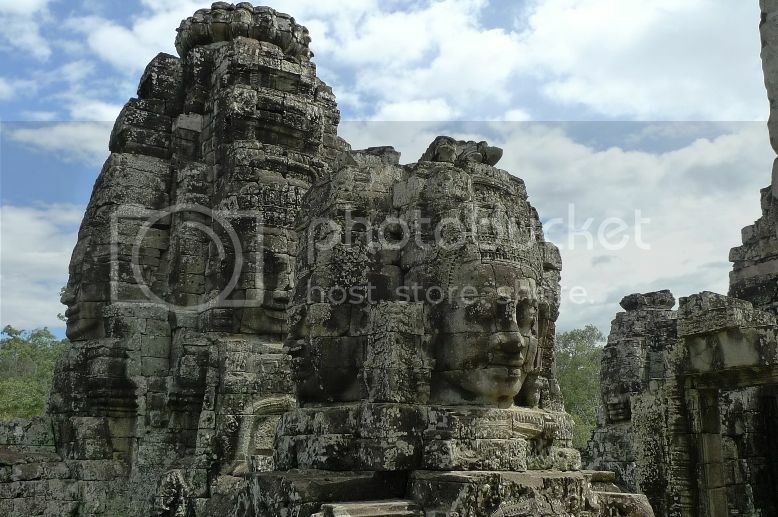 The Bayon was the only Angkorian state temple to be built primarily as a Mahayana Buddhist shrine dedicated to Buddha. 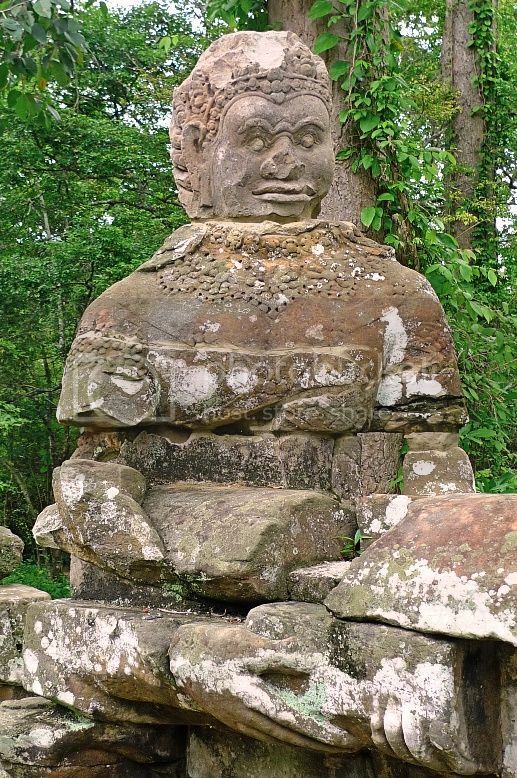 After the death of King Jayavarman VII, it was modified and augmented by later Hindu and Theravada Buddhist kings in accordance with their own religious preferences. 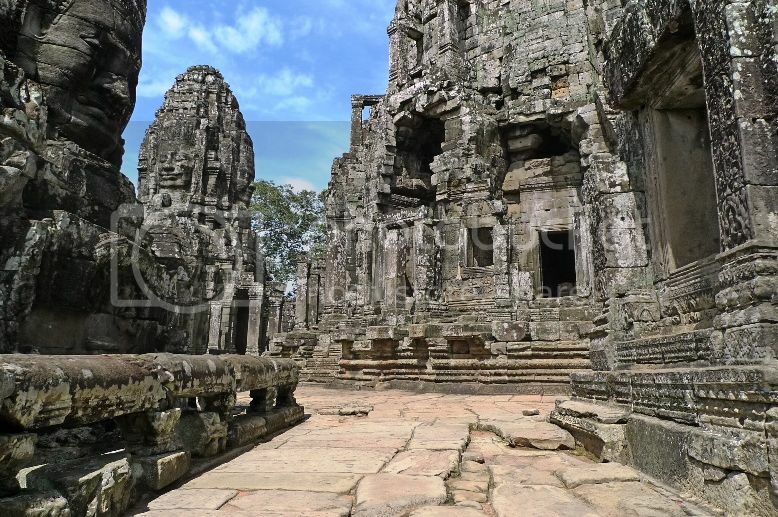 Built as a square, covering a total surface area of 3 square kilometres, the Bayon temple is orientated towards the East, following Buddhist architecture. 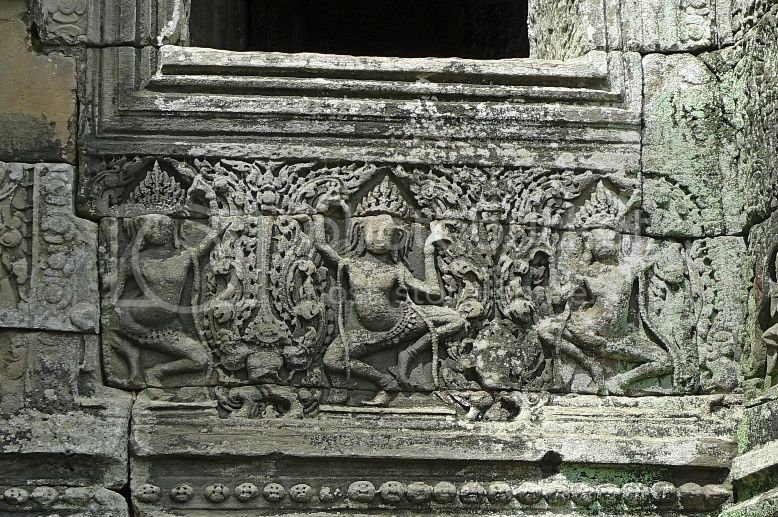 The temple walls featured a lot of bas-reliefs depicting battle scenes and scenes from everyday life. 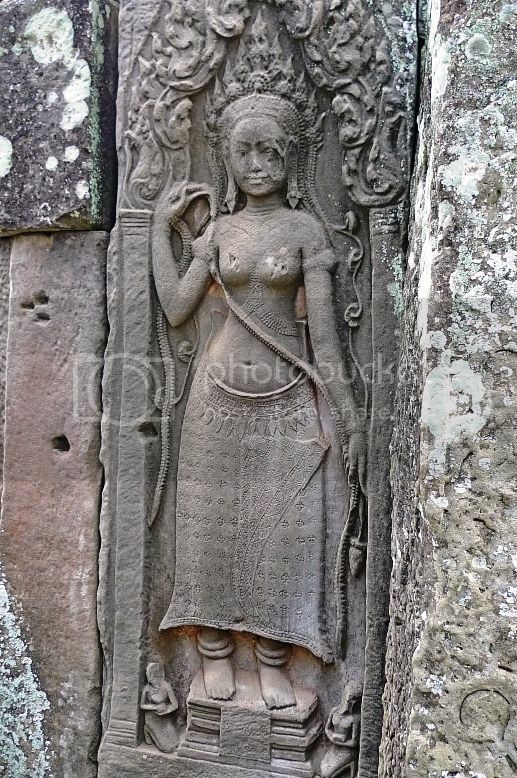 I took some photos of carvings depicting Apsara dancers. By the way, we had a chance to watch Apsara dancers perform the Khmer Classical Dance during dinner on our second night in Siem Reap, but that will be a story for another post. Does this look like a face to you? It sure does to me, and I love it! 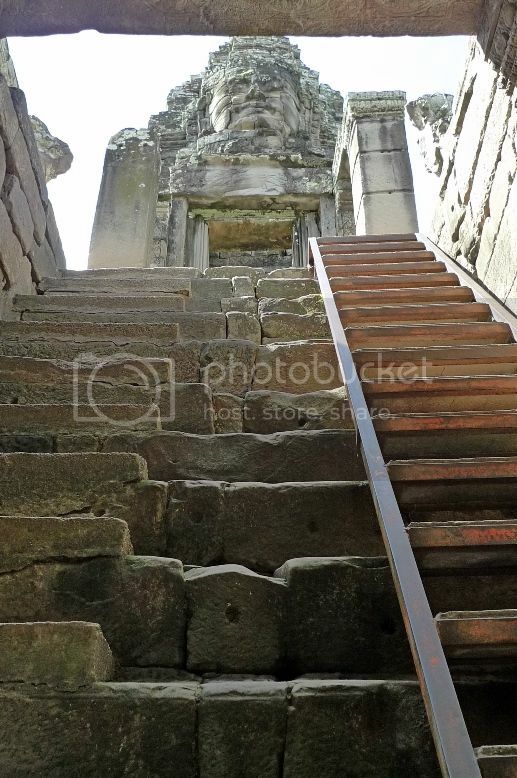 There were many steps leading up to the upper terrace where Bayon's most distinctive feature was found - the over 200 giant stone faces! Going up was easy but coming down was slightly more difficult as the steps looked kind of steep! 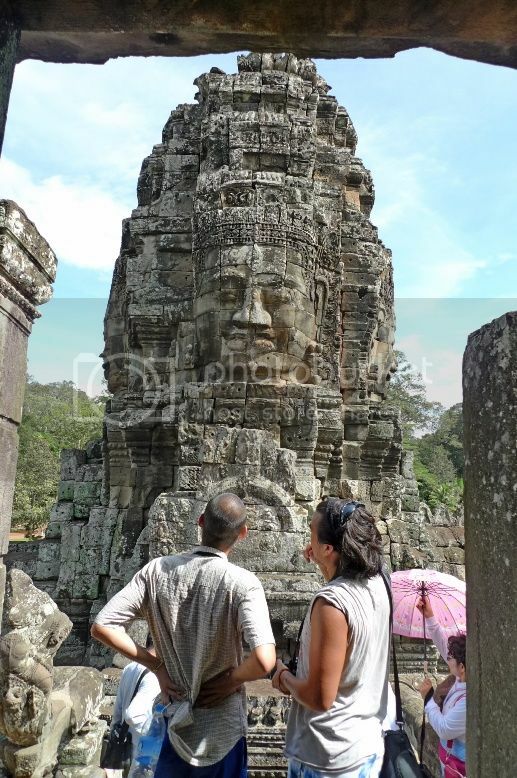 So what do tourists from all over the world visit Bayon for? Yes, it's for the famous giant stone faces! Look at this couple admiring the stone face tower! Tourists were snapping away like crazy. And so was I! There are actually 49 standing face towers (probably less as some had collapsed) with each tower spotting 2, 3 or most commonly 4 faces, each facing the four cardinal points of East, West, North and South. Remember the face tower at the Victory Gate in my previous post? 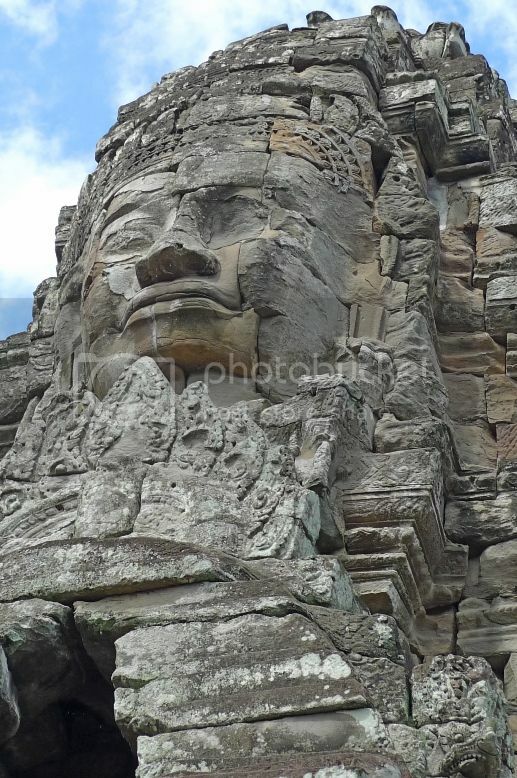 There is actually a face tower on each of the 5 gates surrounding Angkor Thom. 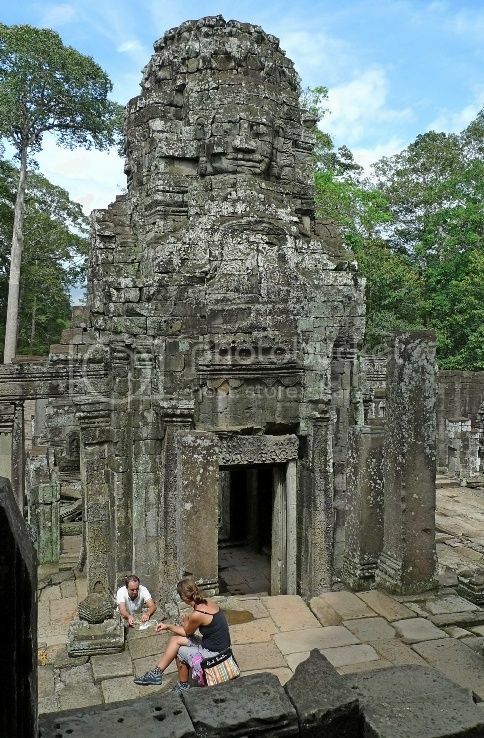 If you were to add up all the face towers in the city of Angkor Thom, the total would stand at 54. It was a very hot day! The sun was burning my skin. I went back down the stairs to walk through the narrow walkways to temporarily avoid the sun. Standing at this spot and looking up the sky was amazing! Look at those rocks piling up to the ceiling. Incredible! 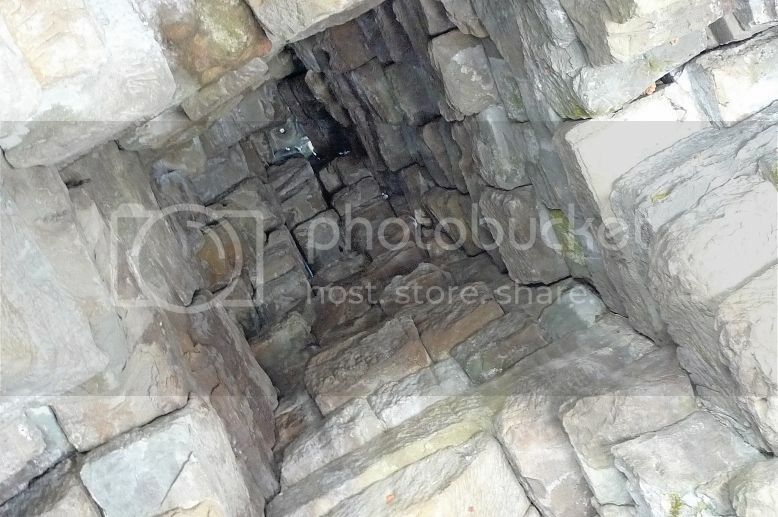 The dark passageways were like mazes - I almost got lost walking in them! But it was a good shade from the unforgiving sun. I even enjoyed looking at tourists! LOL! 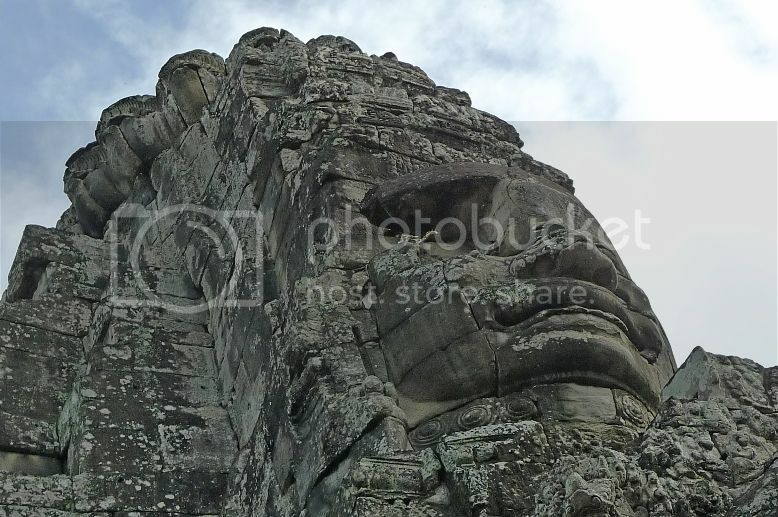 Now the giant stone faces were believed to be the faces of Avalokitesvara, the bodhisattva of compassion. 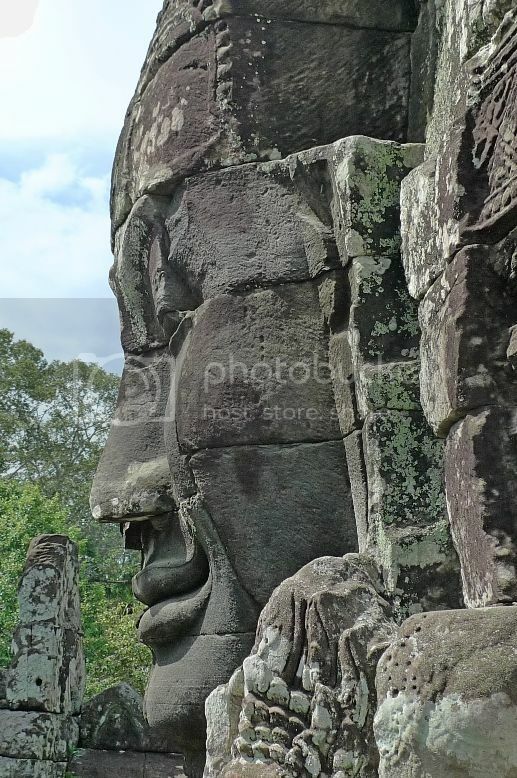 However, many scholars also believed they are the faces of King Jayavarman himself! Some of the faces have weird, mysterious smiles that can rival Mona Lisa's! 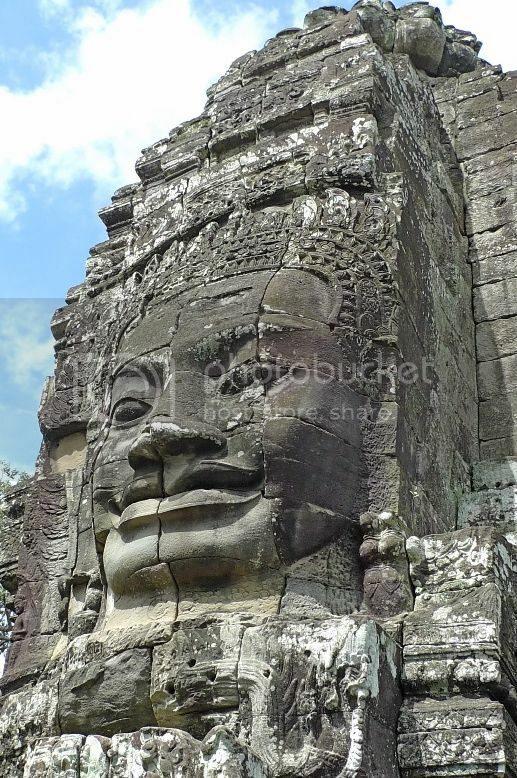 Like this famous Smile of Bayon! Take a closer look at his mysterious smile. 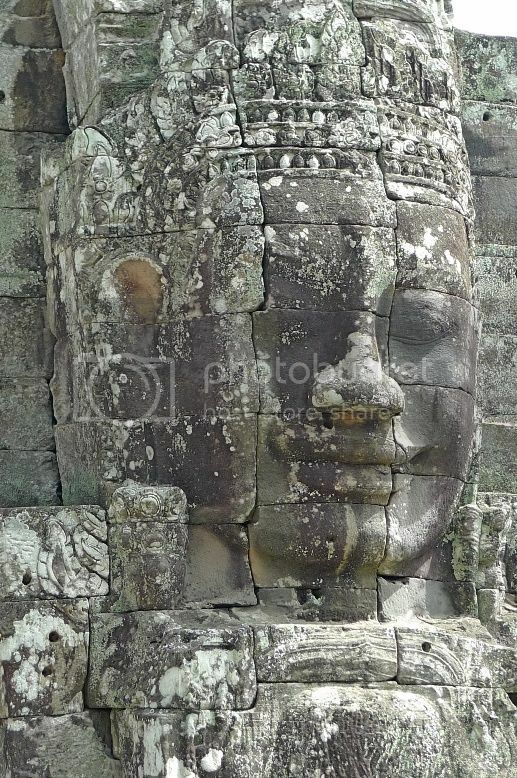 A side view of the Smile of Bayon. 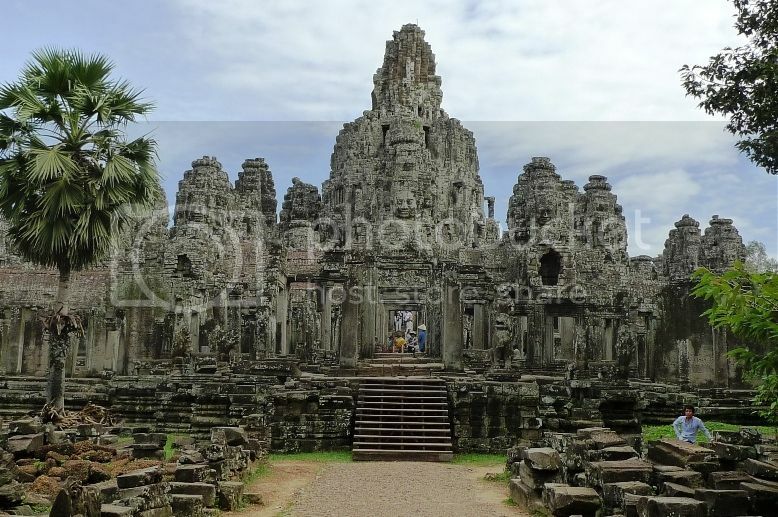 The Bayon Temple had been described as the most striking expression of the baroque style of Khmer architecture, as contrasted with the classical style of Angkor Wat, which I would be visiting later in the afternoon. 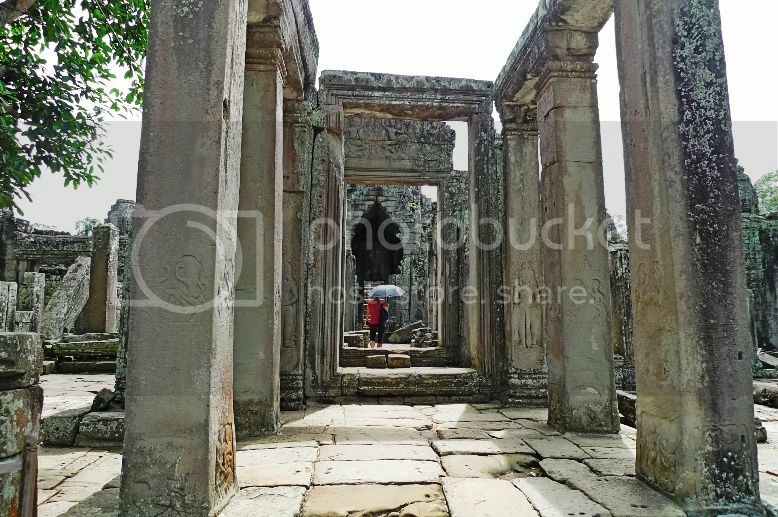 I found the temple a little claustrophobic due to the close proximity of the walls and it did not have the kind of grandeur or majestic feel unlike Angkor Wat. However, it was certainly the most interesting temple ruin I visited, especially with the huge stone faces of Avalokitesvara or Jayavarman. It did however feel a little eerie as if you were being watched by those huge stone faces! How many faces can you spot here? 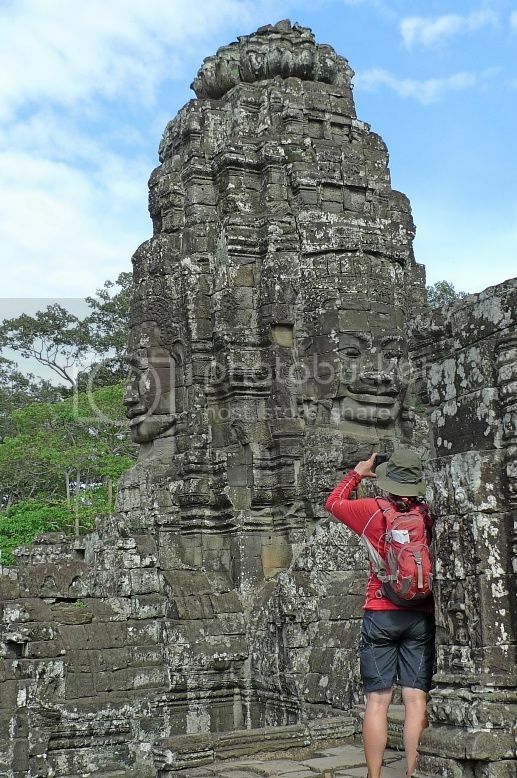 If you plan to visit just two temples in Cambodia, make sure Bayon Temple is one of them! It will surely be a rewarding experience. 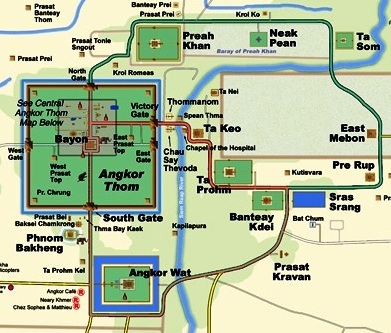 There was only one reason why I wanted to travel to Cambodia and in particular, Siem Reap. 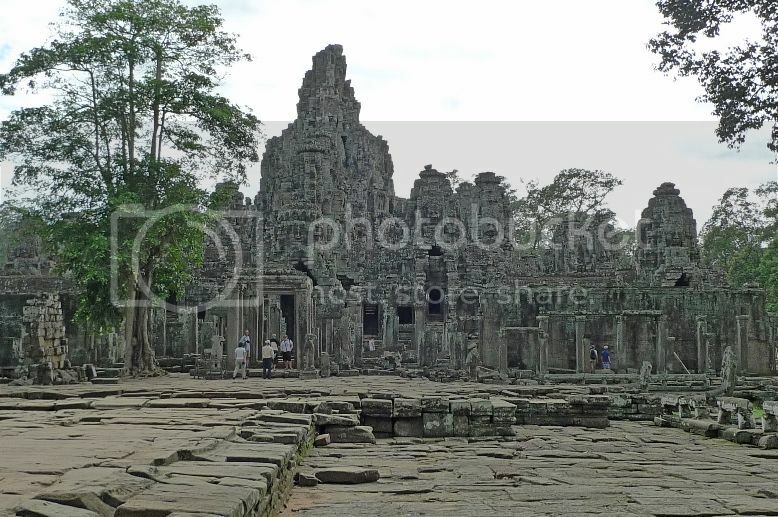 It was to visit the famous temple ruins that were made even more famous by Angelina Jolie in the movie, Tomb Raider. Of course I did not foresee that the food was another main attraction in Cambodia. So yes, even if you don't really fancy all those temples, I still recommend that you go to Cambodia just for the food! 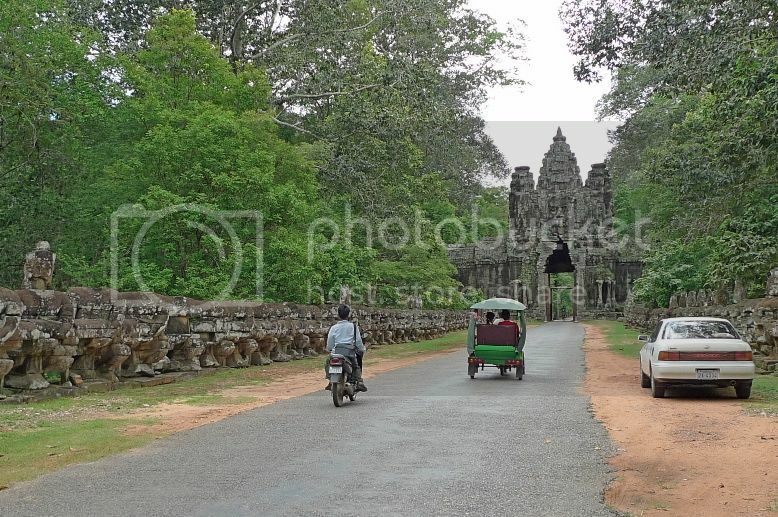 However, if you are a first timer to Cambodia, it would be a waste to not at least visit Angkor Wat and Angkor Thom. 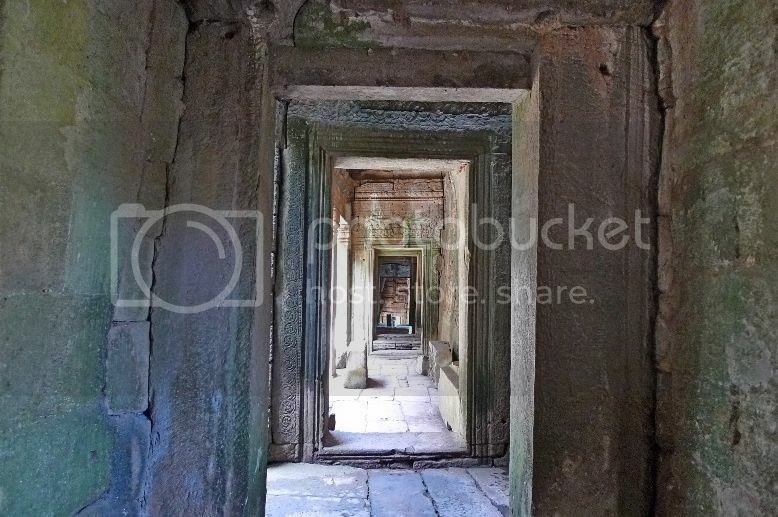 These are just two out of dozens of temple ruins scattered in the Angkor Wat Archaeological Park which was declared a UNESCO Heritage Site in 1992. 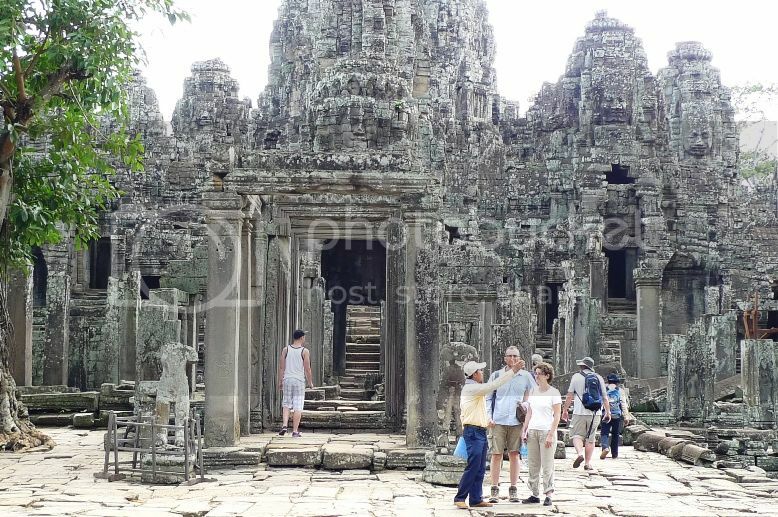 To visit the temple ruins in the Angkor Wat Archaeological Park, you need to possess an admission pass. Passes can be purchased at the main entrance to the park (as shown in the map above). You can choose to buy a one-day (USD20), three-day (USD40) or seven-day (USD60) pass. The three-day pass is valid for any three days (not necessarily consecutive) within one week whereas the seven-day pass is valid for any seven days (again not necessarily consecutive) within one month. Please note that they only accept cash payment and not credit card. Oh, by the way, although the currency in Cambodia is Riel (USD1 = 4,120 Riel), no one is really interested in Riel - basically only US dollar is used. The pass will be checked upon each park entry and at major temples. A hefty fine will be imposed for not possessing a valid pass in the park so make sure you do not lose it! As the pass is just a piece of paper and easily gets torn, it is advisable to keep it safe in a plastic card holder. After lunch at Neary Khmer Restaurant, our driver Xiao He took us to purchase the admission pass. Jam, his friend and I purchased a three-day pass each. 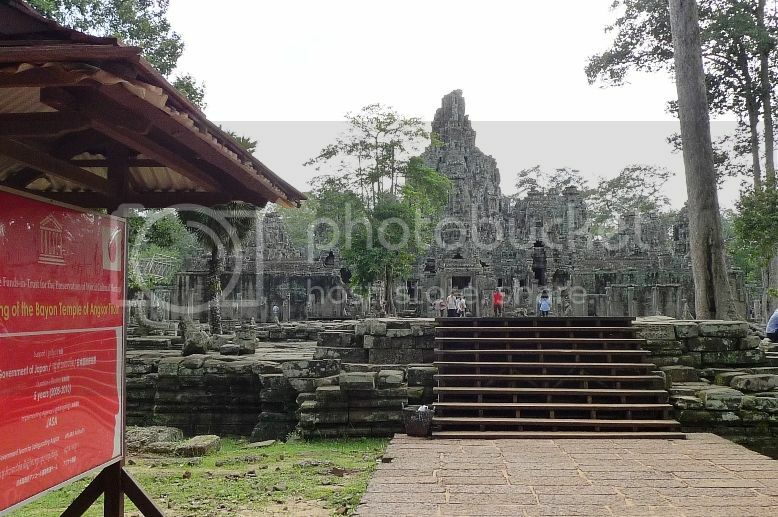 Then it's off to our first destination - the Bayon Temple! 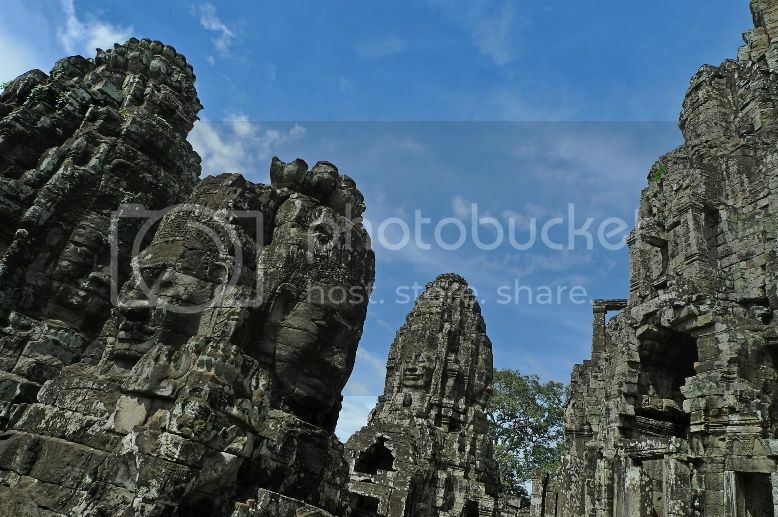 Bayon is located at the centre of Angkor Thom, which was the last and most enduring capital city of the Khmer Empire. 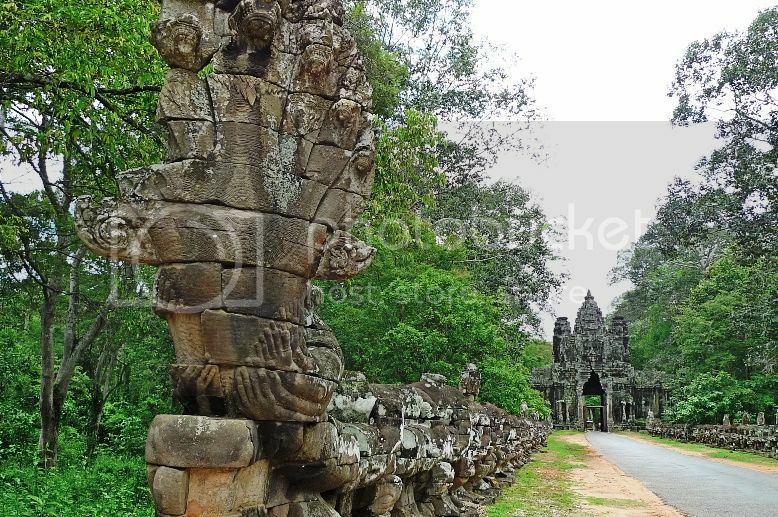 Constructed in the late 12th to early 13th century by King Jayavarman VII, Angkor Thom has a total area of 9 square kilometres which is really quite huge. It is enclosed by a square wall 8 metres high and 12 kilometres in length, and encircled by a moat 100 metres wide. 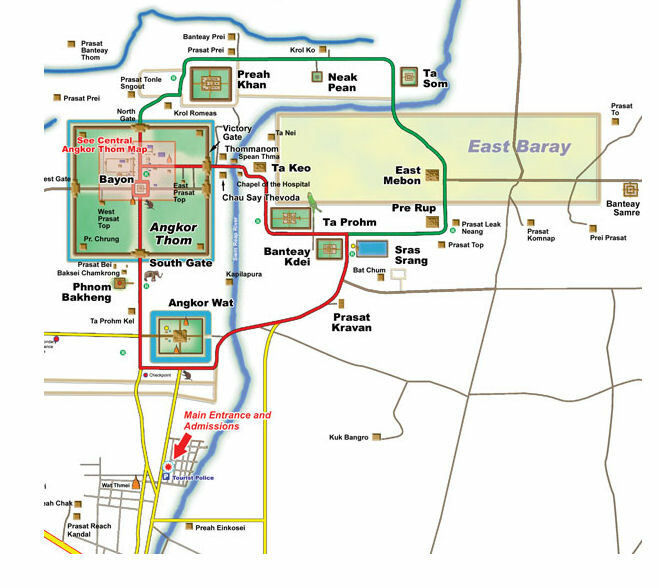 As you can see from the map above, the city of Angkor Thom has 5 entrance and exit gates - one for each cardinal point, namely the North Gate, South Gate, West Gate and East Gate as well as an additional gate called the Victory Gate located just north of the East Gate. 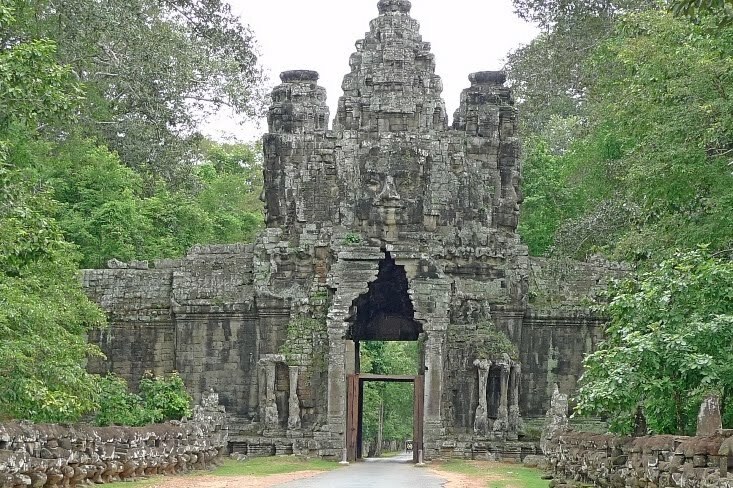 According to Xiao He, the North, South and Victory Gates are usually used to enter Angkor Thom. Both the East and West Gates are seldom used, especially the East Gate as it is known as the "Gate Of The Dead". 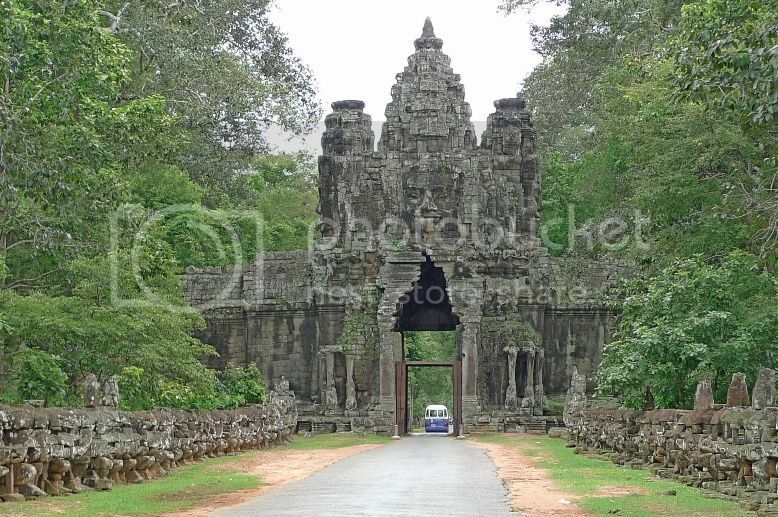 We entered Angkor Thom through the Victory Gate. There is a causeway leading to the gate. 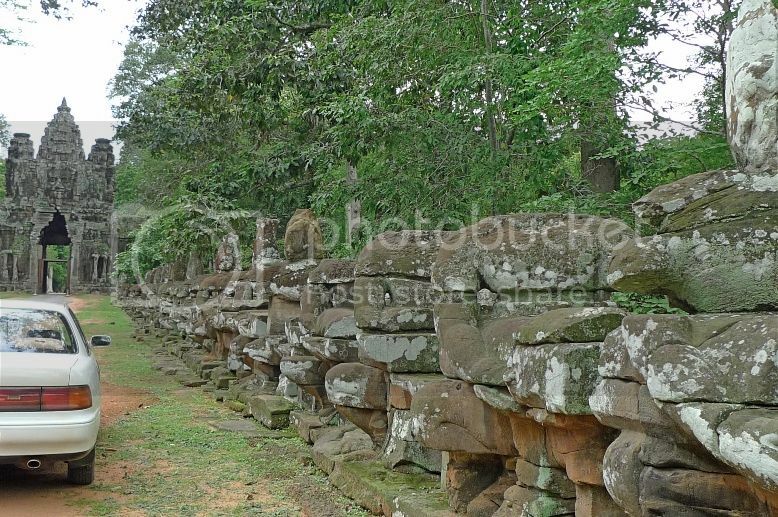 This causeway was built over the moat that surrounded Angkor Thom. See that white Toyota car? That's Xiao He's car. We sat in this car during our three days in Siem Reap. Giant statues lined up on both sides of the causeway - on the left are 54 gods or devas and on the right are 54 demons or asuras. 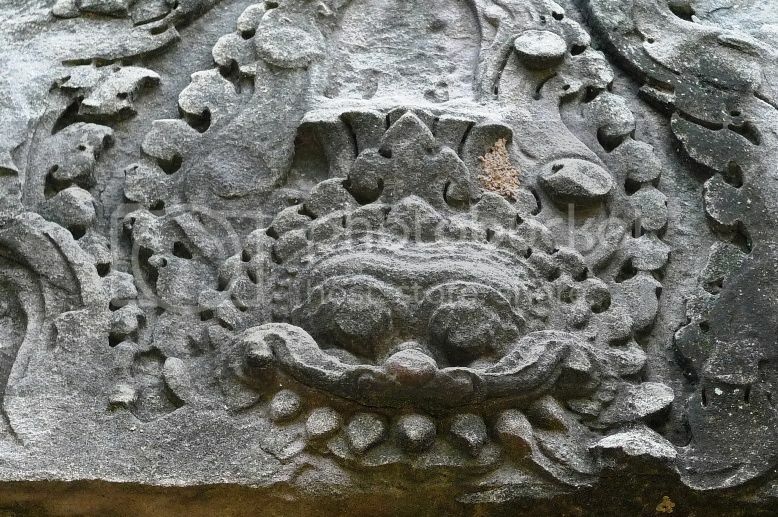 The 54 devas appeared to be pulling the head of the seven-headed serpent called naga while the 54 asuras were pulling the serpent’s tail in the opposite direction. 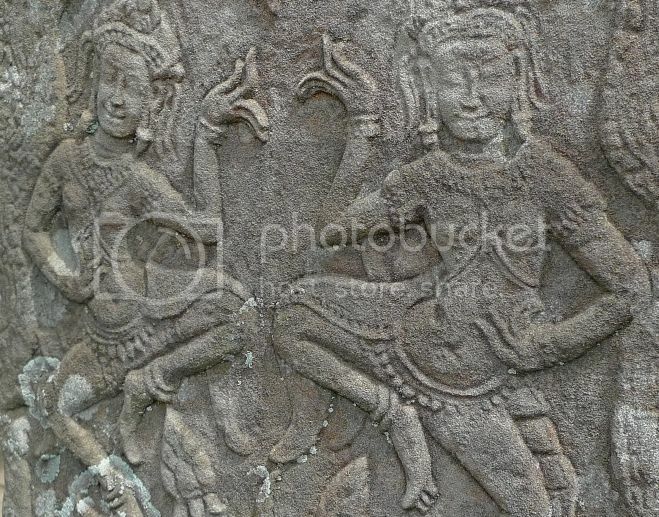 This tug-of-war holding on to the naga is a depiction of the Hindu myth called Churning of the Ocean of Milk, in which devas formed an alliance with asuras to jointly churn the ocean for the nectar of immortality. Most of the statues were broken and probably had their heads stolen. 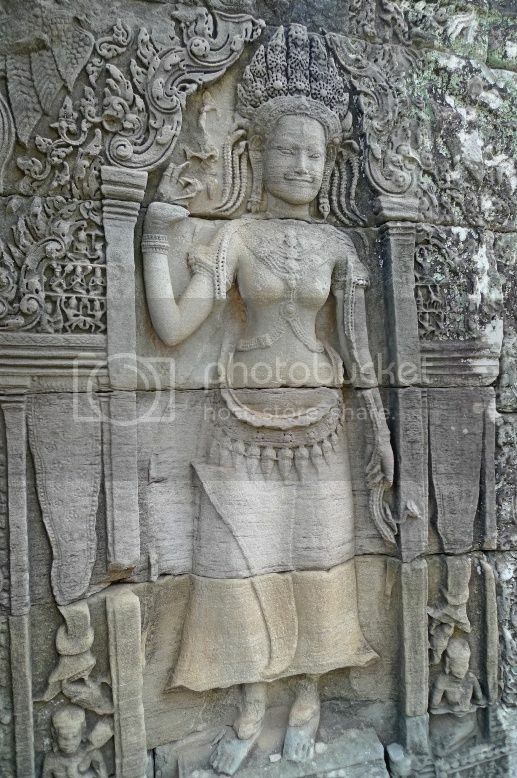 The next morning when we entered Angkor Thom again using the South Gate, we saw similar statues but they were more well maintained and preserved. I shall show you some of the photos in a future post. 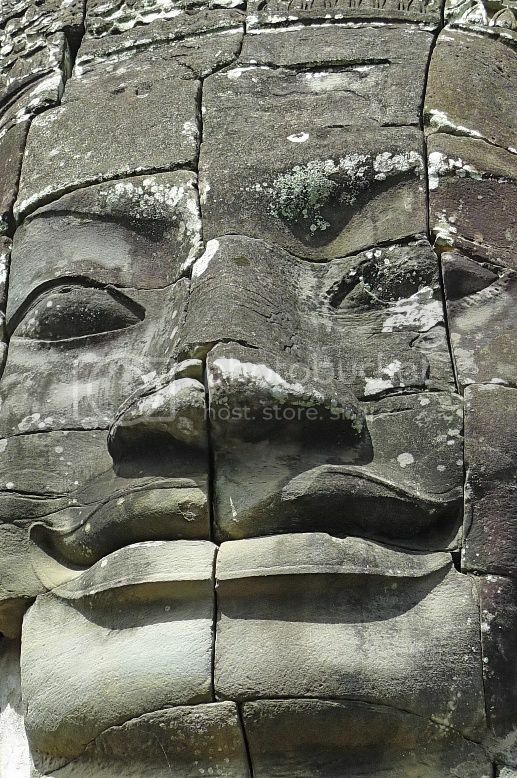 Upon approaching the Victory Gate, we could see giant faces on top, each facing the four cardinal directions. The sight of these faces fascinated me to no end. 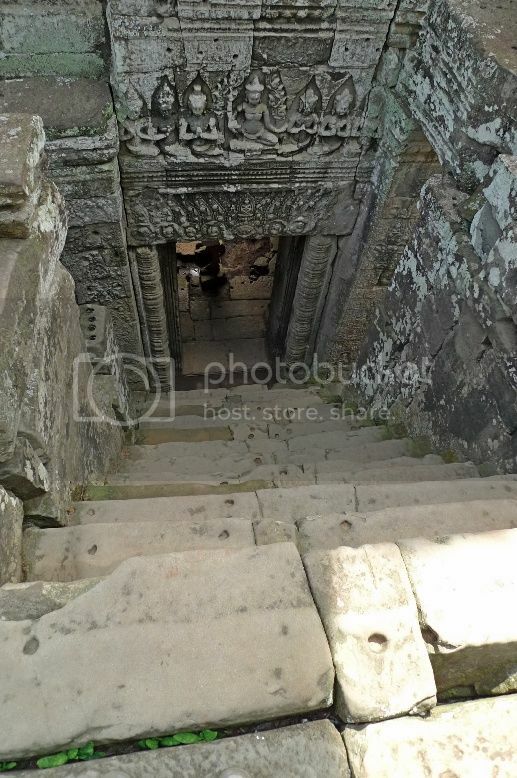 Thus began my interesting and wonderful tour of Cambodia's historical and archeological site! When I was very small, I remember eating a very nice dessert made from flour, gula melaka (palm sugar) and mixed with grated coconut on a pandan leaf. They were packed in a brown paper bag which emitted the most pleasant and appetizing smell a child could ever dreamed of! I had forgotten all about this yummy dessert when I grew up until one fine day, I was at 1Utama, and I saw a Malay lady selling what looked like the dream food of my childhood days! The dessert she was selling was called kuih tutu and I immediately bought six pieces to try. Guess what? After eating one, I threw all the rest away! The kuih tutu was a far cry from what I had eaten when I was small. 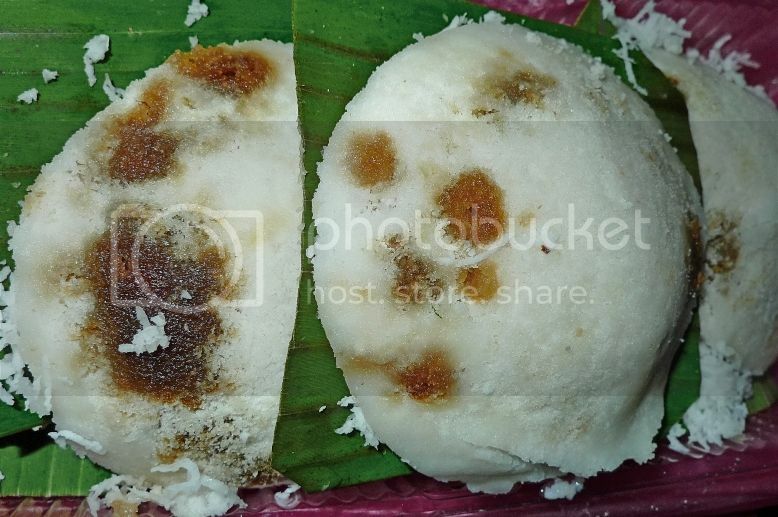 Recently, I read from somewhere about a kuih called putu piring and looking at the pictures, I thought they resembled that yummy kuih of my childhood days! 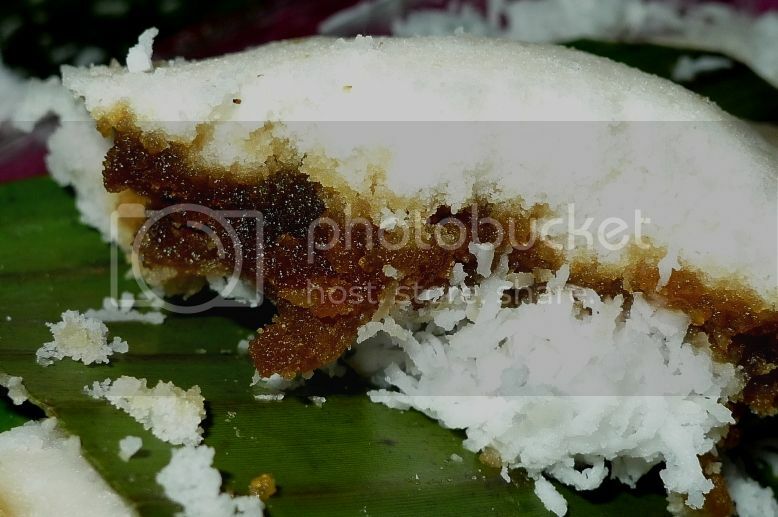 So after some online searches, I found that the most famous putu piring are sold at Jalan Tengkera in Melaka. I knew I had to try the putu piring in Tengkera so one fine weekday, I drove to Melaka. You must be thinking I am crazy to drive all the way to Melaka just to eat the putu piring, but actually I had other agendas in my mind of course. I wanted to visit Jonker Street which I did not visit for many years and I also wanted to try the famous Mille Crepe Cakes at Nadeje. That ... will be another story for another post. Using Google Map, I found it difficult to trace the putu piring stall. It is actually operated by a husband and wife team just outside their house at Jalan Tengkera! Thanks to Tekkaus, my good blogger friend from Melaka who gave me detailed directions on how to get there, I finally managed to find it! It was the sight of this that made me stop my car! 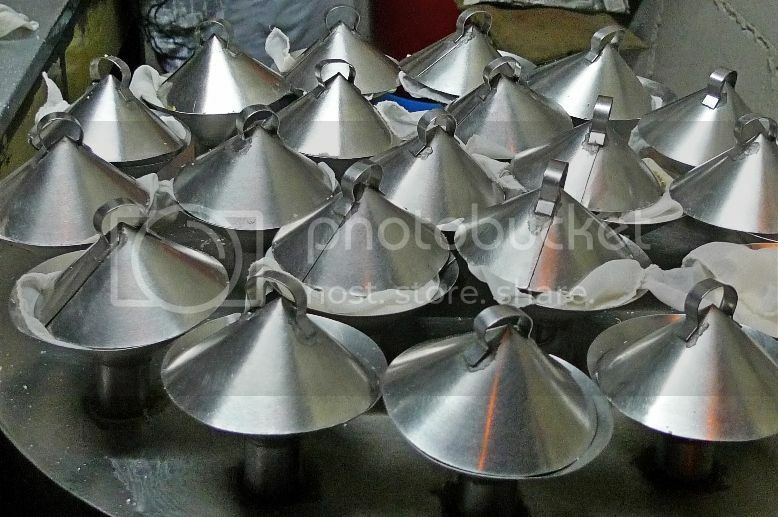 That's the steamer where the putu piring were being steamed! I was so excited!! I was told that there would always be a long queue, but on that day, there was surprisingly no queue. Just one customer ahead of me. I was welcomed by the friendly couple selling the putu piring. When I asked them if I could take photos, the husband said go ahead! Take as many as you want and show the photos to your friends! LOL! He further chatted with me that youngsters nowadays are no longer interested in doing this business. I took it that he meant his children would not want to take over his business. So how does one make putu piring? From what I observed, here's how. 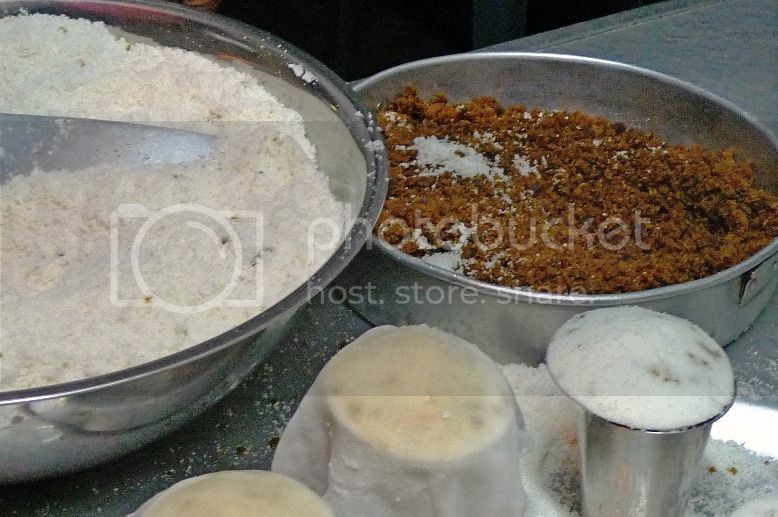 First, you put in the flour into the small cup, then add in the gula melaka, and then put in more flour to cover it up. 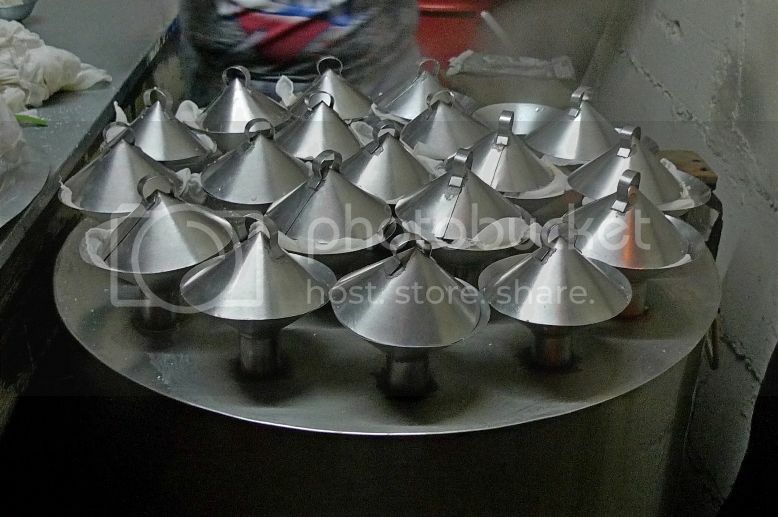 After that, place the cup in the steamer and let it steam for a while. When it is ready, take it off the steamer and pop the putu piring onto a square piece of banana leaf together with some grated coconut. That's it! Sounds easy? Maybe, but I think it requires lots of skills and possibly years of practice! The result were freshly steamed putu piring that made me salivate to no end. I ordered 8 pieces each priced at 90 sen! They were packed in a plastic container. When I got back to my car, I immediately took one and ate. How could I even wait any longer? Besides, it's best eaten when it's straight out of the steamer and still warm! I have to say they were very, very delicious! Biting into its light, fluffy texture, the sweet melted gula melaka oozed out and when mixed with the taste of the slightly salted grated coconut, the combination was nothing less than heavenly! 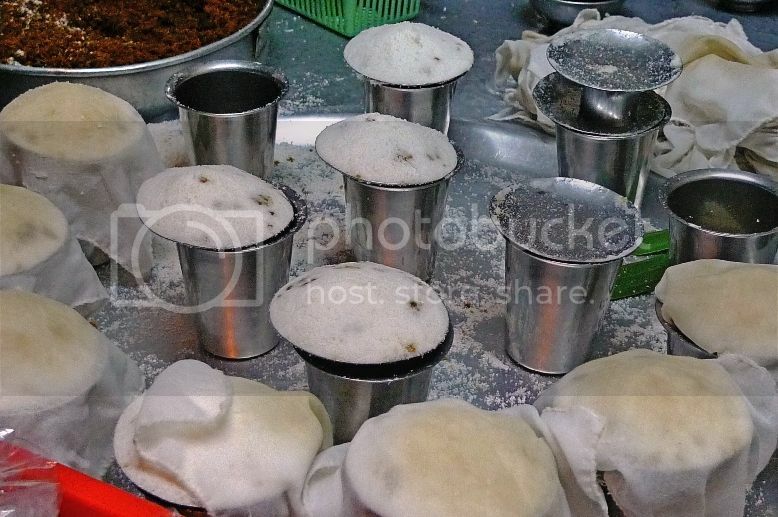 So was this putu piring as good as the one I had when I was small? Honestly, I do not know. I felt something missing. Was it the taste? Or the aroma? I could not be sure. Either the kuih I ate during my childhood was an extremely good putu piring or it was not putu piring at all. Or maybe, as a child, I tend to like it better? Who knows? 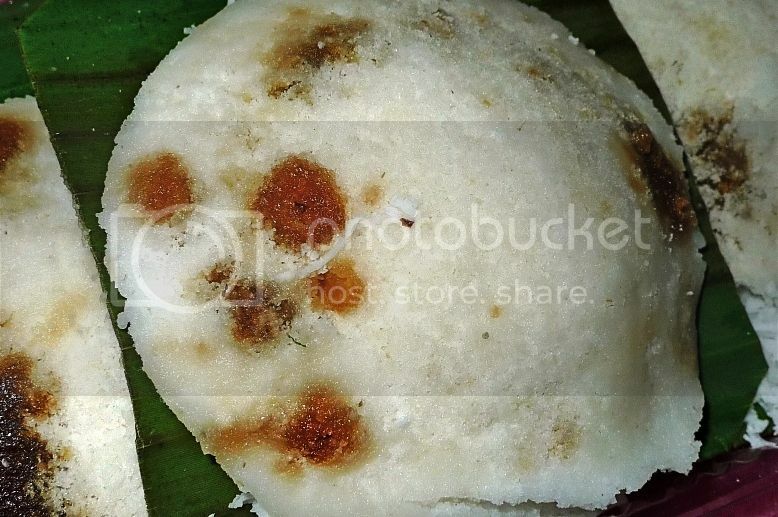 I heard that putu piring was originally an Indian food. 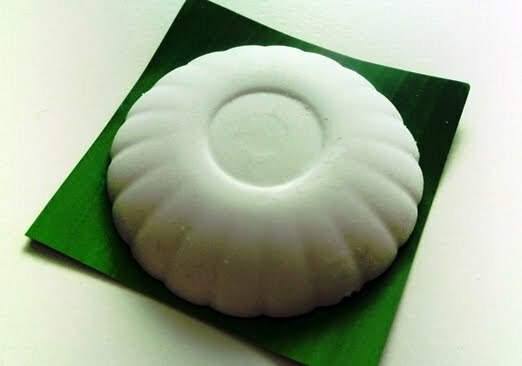 (The word "putu" sure reminds me of putu mayam, an Indian delicacy). I was not sure about its origins though the Malays have their own version, which is kuih tutu. I did not like the kuih tutu I bought from 1Utama, but perhaps there are others who sell better ones? 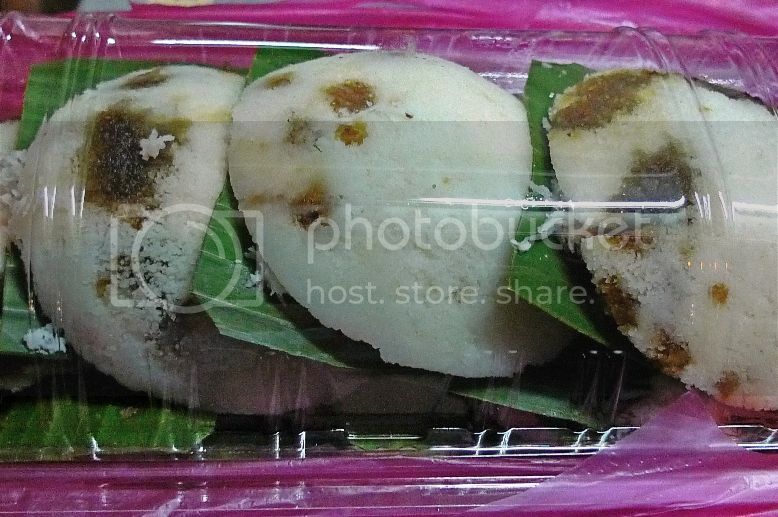 In any case, this putu piring from Tengkera is a MUST TRY. Maybe I am biased because I tend to like anything with gula melaka inside (eg. onde onde, tang yuen) but you gotta try it for yourself! 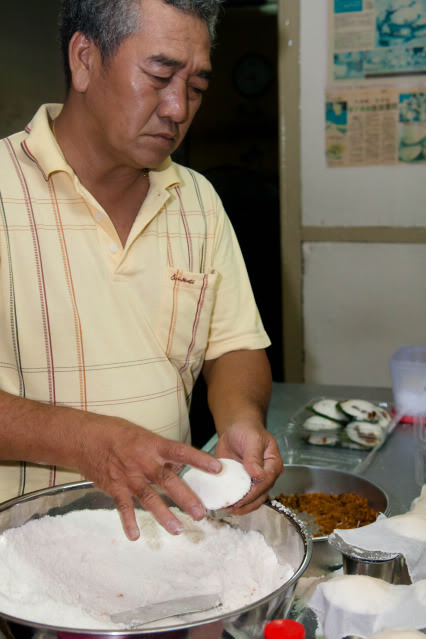 By the way, this putu piring stall was once featured in Taste With Jason show on Astro. From Jonker Street, turn into Jalan Tun Tan Cheng Lock. Go straight, pass a traffic light junction, and keep going straight. After passing a police station and Malim Clinic on your left, slow down. 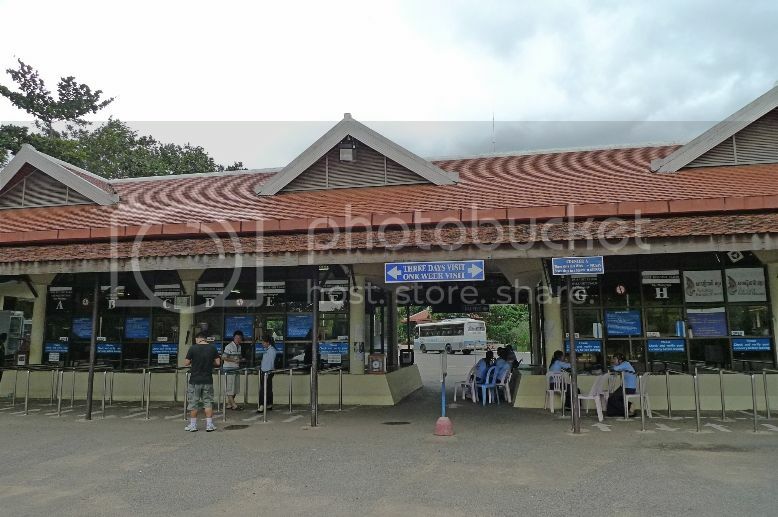 The putu piring stall is somewhere on your right next to a Toto shop.